Culinary Journal #dontbeinflamed - Shonna Steppe. Culinary Nutritionist. This post dedicated to my friend Ginger and the beautifully moody cloudy #greyskies for inspiring me to make a post today :) This is probably one of my first (if not first) truly #foodismedicine posts. B O R S C H T. I adore this dish. I never forgot it when I made it for the first time in culinary school. The image of my dish and its warmth that moved from my mouth to my belly jumped right back to memory as I was driving through the rain today. And I knew I had to make a post bc Ginger’s request was burning in my mind ;). As I’ve begun my studies in botanical medicine and explored the medicinal culinary plants of Chinese and Ayurvedic traditions, I’ve come to believe that people are called to/drawn by the medicines within certain plants. Unknowingly. I never knew there was much beyond simply loving flavor and being an insatiable foodie. But in finding the nutritional gifts of the foods and herbs I’ve unknowingly come to love, Im pretty awed with how specific they are to my own needs. If you take some time to look into the dominant nutrients of your favorite herbs and healthy foods, I wonder what you’d find. Beets: blood purifier, anti-inflammatory, anti-oxidant, cleans out homocysteine (made from common amino acid methionine, found in red meat and dairy) that, when not combined w Vit B9, B12, Glycine and Choline leads to major arterial inflammation, heart problems, brain inflammation and atrophy (not cool; causes a whole host of neuro problems). 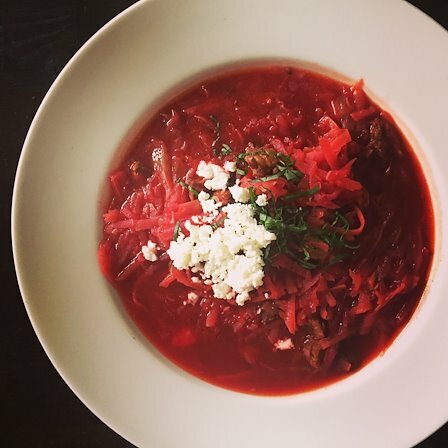 In this recipe I used my own homemade grassfed Beef Bone Broth (~30% Glycine) infused w lots of the Chinese herb Dong quai: blood tonic, encourages circulation, detoxifying, and contains the same amazing B9 (folic acid) vitamin that beets do to prevent and clear high homocysteine levels, and Cobalt (B12 activator). Dong quai is associated w strengthening the Spleen, Kidney, and Liver. And the cabbage has the Choline! (as do eggs, in higher amounts). *I didn’t have cultured sour cream or parsley or dill on hand, so I substituted w Pastured Feta and Basil. Feta is great bc it’s 100% sheep’s milk (easier on digestion) and Fresh Basil is great for digestion.